This entry was posted on Thursday, January 14th, 2010 at 9:18 pm	and is filed under Musings, Thinking about psychiatry. You can follow any responses to this entry through the RSS 2.0 feed. Responses are currently closed, but you can trackback from your own site. I’m glad I’m not the only one who thinks Elizabeth Wurtzel is a pain in the arse. Cats can and do suffer from anxiety for various reasons – usually separation anxiety when the owner is absent, or anxiety where there is tension with another cat in the household. When this happens, they can overgroom, which results in them ending up with bald patches and skin problems. So you could claim that cats self-harm out of anxiety. (You’ll also get them peeing in inconvenient places). Vets will sometimes prescribe (tiny amounts of) diazepam for this, as well as giving advice on how to calm down the cat. Less drastic are the “feliway” hormone diffusers that send out a continuous stream of calming cat hormones. Whether fluoxetine would do much good is a different matter, however. I’d imagine feline brain chemistry is rather different, and in any case, vets don’t know quite THAT much about it, since cats can’t talk. Quite agree with you about Elizabeth Wurtzel’s book. I read it when I was 18 and thought she came across as an annoying prima donna. Cats certainly do get separation anxiety. My mum’s (sadly now-deceased) cat used to become visibly distressed if the suitcases were taken out of the attic, because he’d worked out that meant my parents were about to disappear for a few days. Okay, I don’t argue that cats can appear aroused in a way that, if they were human, you might describe as being ‘anxious’. However we have no way of knowing a cat’s inner emotional state and to even consider that they have an ‘inner emotional state’ is to project onto them human characteristics. Anxiety is a poorly defined, one definition is ‘a fear in the expectation but not certainty of an unpleasant experience’; to assign this to a cat in a meanful way is to seriously stretch the concept. “we have no way of knowing a cat’s inner emotional state” – or any other being’s, including fellow humans, either. Are emotions human – and only human -characteristics? Surely they’d have to be a lot better defined before we could declare that. At the moment, all we have are surmises about the commonality of human emotions – which may well be strongly cultural, to boot – and observations of reactive behaviour in situations which we (think humans) connect emotions with events, and that we see in just about evey sentient being. “The experience of a human disease such as depression involves complex human attributes such as thoughts, emotions and language.” Pity no-one told Harry Harlow or Martin Seligman that. I would agree with you that any argument we have hinges on the definitions we promote. - how do you tell? - if so, what does it mean? We cannot obtain spoken answers but in the absence of this we assume anthropomorphism. On the other hand we do know ‘inner emotional states’ from humans because we can tell one another. Errr- “know” ? “tell one another” ? well, we can try to tell one another about emotional states unknown in our culture (“song” experienced by the Ifaluk, e.g. )or our time (accidie, experienced in the Middle Ages) (Edwards, in Wetherell, Taylor and Yates, 2001, pp238/41) although we can’t experience them, and those we think we can experience we can’t reliably convey (or know we have reliably conveyed) to someone else. There is so much work – Kaak Panskepp, e.g., on animal and human emotion going on, it seems a shame to throw out superficialities like “projecting human characteristics onto animals” without at least trying to unpack the relationship of any animal (including the human being) to the whole emotional field. I think you’ll find that we agree. Vets have observed two cases where cats exhibit behaviour which mimics some forms of anxiety in humans. Your average vet is mainly concerned with fixing the problem, rather than theorising about what the cat is feeling internally (although of course, he or she will seek to minimise pain or distress to the animal). So, they will use the term “separation anxiety” or “anxiety” as a label for the state they have observed in the cat because they have to call it something and this is handiest, rather than because they are anthropomorphising. Then they advise the owner how to make the cat feel more relaxed, suggest a Feliway diffuser, additional litter trays, and in extreme cases, prescribe tiny doses of diazepam. It’s a ridiculous leap of faith to suggest fluoxetine would be much good, unless there’s a raft of clinical data to the contrary. (Disclaimer, I am not a vet, although I know several). Canine Separation Anxiety: file under Projective Identification methinks (anyone want to update the Wikipedia article?). That said, tis a fine beefy flavour, Reconcile. I sometimes use it as a stock cube when making soup. FP, I find it kind of absurd that you can’t conceive of animals having something approximating human emotions without attributing it to a “projection” by the owner. Perhaps I’m biased. I have a dog that I love dearly, but let me put this to you from another angle: Do you agree that a dog can be excited? Start out in a calm state, then with the introduction of a stimulus that the dog finds desirable (for this example lets say their owner returning from a period of separation), that the dog could feel excitement? Having witnessed such behavior I certainly do. Now, is it so hard to make the logical leap that the dog could feel anxiety at the prospect that this desirable stimulus could be removed permanently? I understand where you are coming from insofar as the dog has no idea what anxiety is, but I believe that an animal that has such a close relationship with humans as canines do that it is quite possible, if not certain, that a dog could feel the potential loss of this stimulus as undesirable, and therefore become anxious when confronted with separation from it. Emotion is not exclusive to humanity. To think so is arrogant and naive at best. After 4 years of battling an extensive allergy problem with my dog, she also developed and OCD licking/chewing issue (probably because her skin itched so much). With reluctance, we started her on Prozac generic. It has been 30 days and I RARELY see her traumatize herself to the point of bloody anymore. I am not on any medications, go to a naturopath, believe that doctors over prescribe and patience over indulge in behavior modification. I truly believe that our society is not conducive to humans and the push to be “normal” is actually a push to adapt to abnormalcy. Either way, it is reality and I believe these drugs have their place due to… “it is what it is”. If this plan is successful, I will be a supporter of Prozac as treatment to dogs. She seems to have zero side effects. Well that’s torn it! My dog was reading this with me and the look on his face said “you better get me along to the doctor real quick, I want some of those doggie pick me ups” I’m sure that’s what that look meant. Some times new “diseases” and “pre diseases” terms are made up and of course must be medicated. I would say it was about marketing. Eli Lilly would be looking for additional sub markets and decided to extend the drugs to the treating of animals. 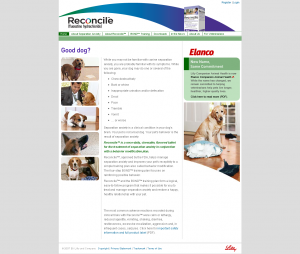 I had considered buying Reconcile for my dog. However I don’t know if I will be doing it more hard than good. The dog looks down, however it does not talk and so I cannot tell for sure. My vet told me there is nothing unusual with the dog so in the end I ended up not buying the Reconcile. My dog suffers from SAD in the winter and I considered buying a light box for him. My vet didnt agree and suggested an anti-depressant. I’m not sure how safe this would be long term. Psychiatrists have little or no understanding of human psychology, let alone that of cats and dogs. Every time a drug is prescribed such as Prozac it is a human experiment, and the sale of a profitable overpriced drug. Or in the case of animals an animal experiment.